Advertising isn’t really any different. If that genre gets on your nerves, this is not the book for you. Plain and simple. If you’re willing to go that route, however, you could do much worse than this novel. John Kenney has a caustic sense of humor that I really enjoyed (this book was presented to me as ‘perfect for fans of Then We Came to the End,’ and the humor, at least, hits this mark). Kenney also has a great deal of insight into the world of advertising, where presenting an image is, literally, the point. Dolan’s disillusionment with the process goes beyond the realm of Madison Avenue, however; the problems he has with his job (superficiality, dishonesty, lack of connection) could all be applied to the modern world at large, making Truth in Advertising a relatable story (if you happen to be in tune with the problems of a white middle-aged upper-middle-class man with a messed up family and a tendency to screw things up, that is). 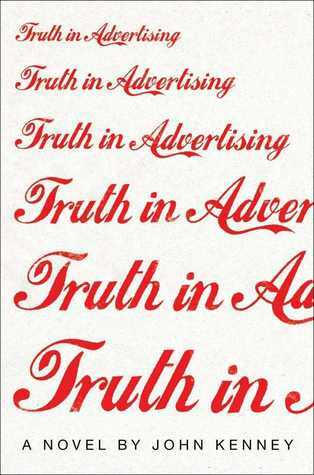 But where Truth in Advertising really shined for me was its depiction of the complex relationships that come out of a messed up family. How you can push away people you love because they remind you of deep hurts from long ago. How anger, resentment, and sadness never really leave you unless you meet them head-on. Most importantly, how hard it is to say goodbye to the parent who inflicted all of these things on you. What is the appropriate response when someone you don’t want to be around but is inextricably part of your life, gets ready to leave you forever? It’s deep stuff, and Kenney navigates the minefield admirably. In the end, this novel stands out as a winner in its genre. How much you like it depends on your acceptance of that genre, but it’s a darkly funny, moving novel that’s worth a look in this reader’s opinion. I would particularly recommend it to fans of Jonathan Tropper and the aforementioned Then We Came to the End. PS As per my mission statement, you may be interested to know this book was given to me by Simon & Schuster in exchange for this review.